This morning saw Brent and WTI oil prices turn negative on the week. Both oil contracts have recently stalled around key long-term and psychologically-important levels at $80 and $75 respectively as market participants weigh the risks of a potential correction in prices. That’s because supply of crude oil is set to rise. For one thing, Libyan oil supply is set to return and export operations will be back to “normal levels within the next few hours.” That’s what the nation’s state oil company said earlier as four key export terminals, which have been handed back by rival factions in the east, are set to re-open. Some 800,000 barrels of oil per day will be exported again and this should calm fears of a growing oil shortage in the market. Meanwhile, more output is expected from the OPEC to hit the market as we head further into the second half of this year, most notably from Saudi Arabia, the cartel’s de facto leader. In the afternoon, WTI oil prices briefly spiked higher before turning lower again after the US Department of Energy reported the biggest weekly crude inventory drawdown since 2016 at 12.6 million barrels. On top of this, crude stocks at Cushing fell by a good 2.1 million barrels. Clearly, demand for gasoline (as indicated by a 0.7 million weekly drawdown here) during the driving season is continuing to weigh on stockpiles. It remains to be seen however how much further US oil stockpiles will go down by given that China is unlikely to purchase oil from the US due to the ongoing trade spat between the two economic powerhouses. If anything, China will probably continue purchasing oil from Iran, in a bid to undermine Trump’s influence. Meanwhile with Libyan oil production set to return and as noted above OPEC output set to rise, oil prices may struggle to go further higher in near term outlook. Indeed, the OPEC itself expects non-OPEC supply to rise more robustly in 2019 than it had previously anticipated. It also expects the growth in oil demand to slowdown next year to 1.45 million barrels per day compared to the growth of 1.65 million bpd this year. 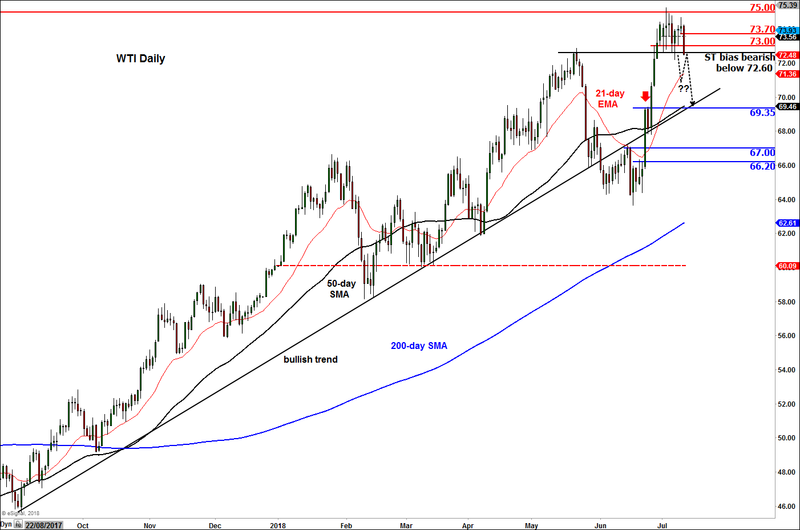 WTI has now broken below support at $72.60 and this has tilt the bias in bears’ favour. If it holds below $72.60 now, this could lead to further technical selling pressure, paving the way for a subsequent drop towards the bullish trend and support at around $69.35 next. However, if the buyers defend their ground and prices go back above broken supports at $73.00 and $73.70 (levels which “should” provide resistance) then a return to $75.00 would not come as major surprise. In any case, we can’t see prices going significantly higher without a sizeable correction first. 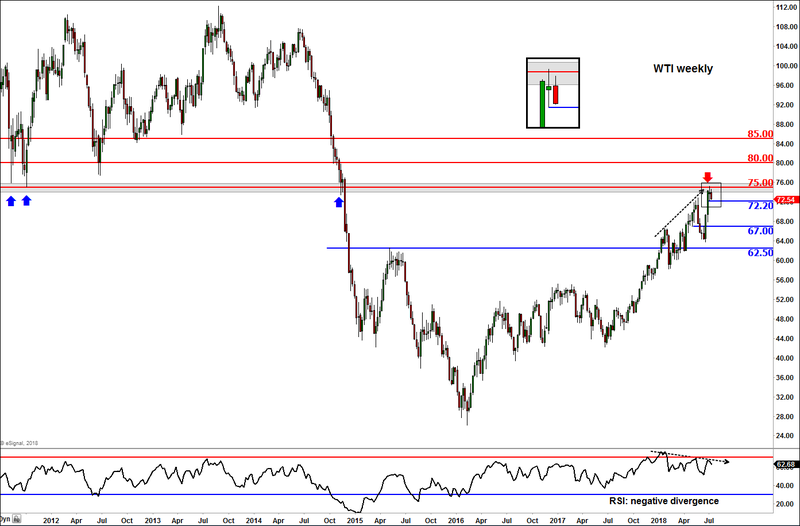 In fact, the higher time frame weekly chart of WTI shows an even scarier picture for it has turned lower from a long-term broken support level i.e. $75 and formed a spinning top pattern there last week. 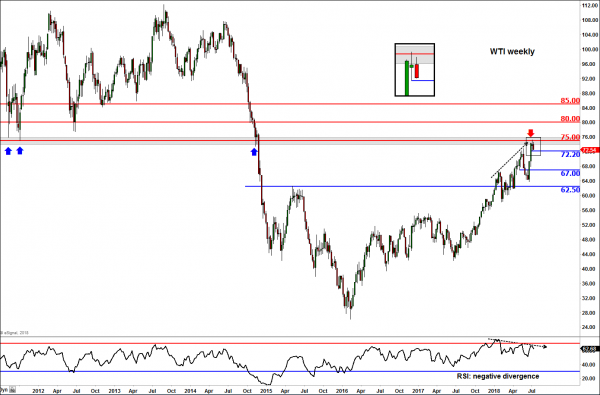 Also supporting the bearish case here is the fact that the momentum indictor Relative Strength Index (RSI) has been in a state of negative divergence with prices, with the RSI making lower highs despite oil prices making a series of higher highs. This divergence clearly indicate that the bullish momentum may be fading, which is significant as oil has now respected resistance.